I hope you got here from Lamar-Dixon Chronicles: The Story Begins so you have some context. If not, I suggest you go back to the beginning (Lamar-Dixon Chronicles: Introduction). Each episode links to the next for continuity. After the first round of discussions and fundraising, I started sending out email updates almost every day as I got reports from our volunteers in Louisiana. That is when the story got its name – the Lamar-Dixon Chronicles. As an additional challenge for both the volunteers and the regional, Hurricane Rita decided to make an appearance. At first it appeared just to affect their travel plans as it swept through Houston, but as you’ll see soon, it dealt another devastating blow on the whole gulf coast and required our volunteers to evacuate. But I’m getting ahead of myself. The good news is that all three missionaries have arrived safe and sound, although not completely without incident or adventure. Day 1 (Tuesday): Sandy and Wendy got their first unexpected event before they even got out of the Bay Area. Apparently, Wendy’s airplane had been hit by lightning on its prior leg and had to be grounded. This obviously caused a delay (and more than a little consternation) while they waited for another aircraft to be commissioned. When they finally arrived at New Orleans, the airport was desolate – nobody around except for employees and other folks from their flight. That made the baggage pickup and rental car procurement easy. HI all …thought you would like a little update from Sandy…. Sandy says they had RV problems last night and didn’t get it taken care of until 1:30am so they didn’t work yesterday. She says they started working this morning and at 10:00am; she was asked to work with aggressive dogs and then at 11:00 they asked her to be a barn manager. 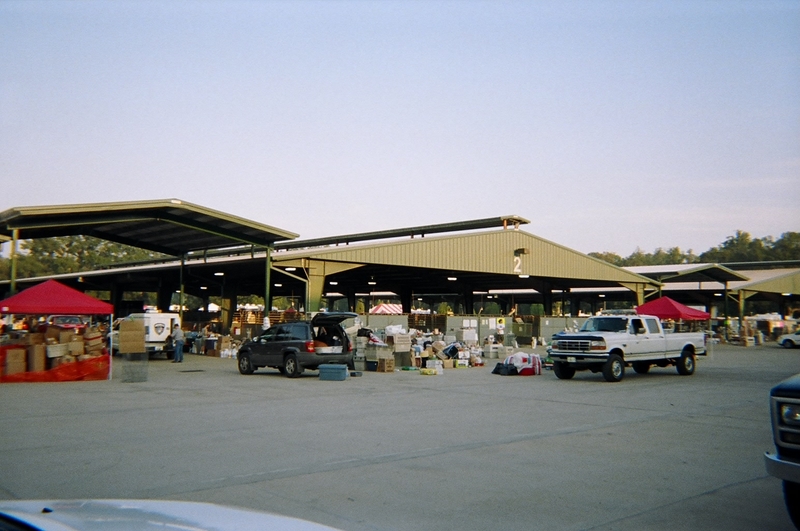 The shelter is located in horse barns at a fairgrounds and the dogs are in cages stacked in the horse stalls. It is very hot and there are tons of supplies. Food, crates etc and no organization. She said it is organized confusion. She said they weren’t expecting anymore animals in now. I guess they feel any that can be rescued, have been rescued. They work in teams. ; one walks the dog and the other cleans the cages and put in food and water. She said that all the dogs in her barn got two walks today. Tomorrow, she wanted to see it they can get the supplies organized. It took her and Wendy 1 1/2 hours to get all their supplies ready to start to work. She is a little worried about the flight home as they are supposed to connect in HOUSTON. Her mom will keep her updated with the hurricane reports as they do not get any news at all. I have an image of trucks and supplies and animals and people everywhere. They were asked to start work immediately that evening, but they wisely opted instead to get acquainted with the RV and settle in for what would likely be their last decent sleep of the week. I know that Sandy didn’t sleep the night before she left, because I got an e-mail from her at 3:15am. 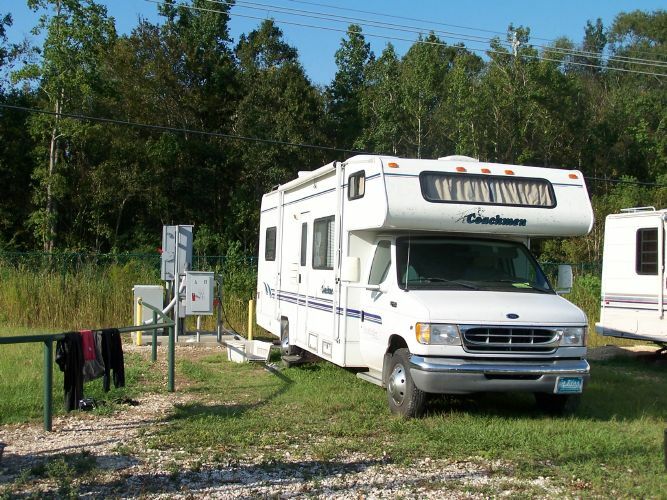 The RV is no luxury mobile, lacking a TV or even a car radio. And they were unable to get the generator started (the RV problems Nancy referenced). They were able to relocate at least temporarily to a parking spot with a plug-in, but they may get thrown out of there and then the generator repair will become a high priority. Day 2 (Wednesday): Sarah left this morning from Oakland, with a scheduled 2-hour layover in Houston. She says Houston-Hobby is a zoo – Houston has already implemented voluntary evacuations for Rita, so everybody is trying to get out of there. Fortunately, not many of them are trying to get to New Orleans so her flight was unaffected. During her flight, she met a shelter worker from Napa who is going to stay in a tent on the grounds! A woman no less, braver than most, I’d say. I want to add a couple of things to the update that Nancy sent. Any of us who spent time at Power Paws Camp when Sandy was Camp Manager are not the least bit surprised that she was promoted to Barn Manager within an hour of beginning work. Also, I’m hopeful that Rita won’t affect their trip home. If it hits the coast on Friday night as expected, it should be worn out by that time. Unless it completely takes out the airport, they should be OK by Monday/Tuesday as scheduled. Financial Update: Because of the incredible generosity of everybody remotely involved with these three (with money still coming in), it looks like our funding will exceed their expenses, barring any unexpected costs if fleeing from Rita becomes an issue. We have a couple of choices: leave the money behind with the rescue organizations as originally proposed, or challenge two or three more people to follow them in for a second shift. We’ve already had interest from a vet tech in SoCal who wants to go, but doesn’t want to go alone. If anybody is seriously interested, I suspect we can drum up more mileage awards for the airfare (one person already volunteered), and we can probably arrange to rent the RV for another week. Think about it and let me know. This entry was posted on Thursday, September 22nd, 2005 at 2:52 pm and is filed under Hurricane Katrina - Lamar-Dixon Chronicles. You can follow any responses to this entry through the RSS 2.0 feed. You can skip to the end and leave a response. Pinging is currently not allowed.